Last weekend I put the final stitches in the binding, so...my biased quilt is complete! This is a simple string quilt that was foundation pieced onto phone book papers, which are later removed. (You can find an in depth block tutorial here.) It's a great use for a phone book, don't you think??? :) While the construction method is fairly straightforward, the color work is complex, I would say. It was a fun quilt to build, one string at a time. I am VERY pleased with how it turned out! I kind of got sucked into this project and I didn't want to work on many other things at the time, so I pieced it rather quickly. (That's a good thing!) I used solids from a variety of manufacturers in more colors than I could guess. 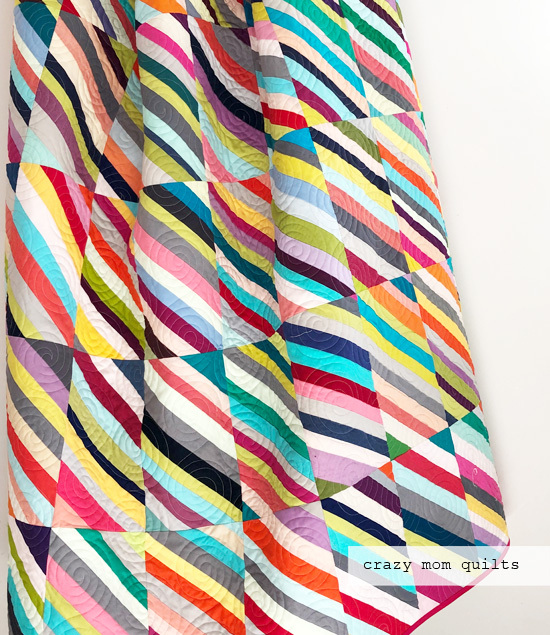 I know I say this all the time, but as with any scrap quilt, more is better! For the back, I used this BRIGHT lemon yellow print from my good neighbors fabric line (which is out of print). The binding is Kona pomegranate, which is a beautiful pinky-red that is super hard to photograph accurately, but trust me --it's a good one! It's one of my current favorites, actually. I made biased binding for this quilt, even though you can't tell, because it's a solid fabric. Since the name of the quilt is BIASED, I thought it was fitting. It's the little things, right? There was no question in my mind that I was going to send it out to be quilted professionally because I didn't want to mess it up! The quilting was done by Steffani Burton. (Thanks, Steffani!) I love the contrast of the quilted swirls against the graphic lines of the piecing. I think it makes a nice pairing. I labeled this quilt right away, too! Labeling isn't my favorite, but I feel that it IS important and I'm trying to do it more consistently. Two in a row is a pretty good start. Ha! The quilt measures about 60" x 75". This is my second quilt in my Salute to Solids series, where I am on a quest to make 10 scrap quilts from the solids bin. You can see the first quilt in the series here. I'm going to be teaching an improv string class based on this quilt at Glamp Stitch-a-lot in Ann Arbor, Michigan in November. You can find more details here, if you are interested! Ok, that's it for me today! It's your turn to link up your finishes for the week. Thanks, as always, for joining me for finish it up Friday! Have a GREAT weekend! Amanda, I love how it turned out!!! Love, Love, Love!!! Scrappy and solid, just amazing!!! And your color work is truly an art, I love how you take so much variety in colors and yet it still looks balanced. Amazing finish!!! Wow, that's a fun quilt to look at! This is so beautiful! I love the curvy quilting! The subtle change in the angles is so effective! That Quilt is beautiful! So much movement. Congratulations on the finish and the label. Gosh! Love love love it! Oh, all those lovely solids! What a fun quilt! This is CRAZY beautiful Amanda Jean!!! My favorite quilt I've seen in a long time!!!! 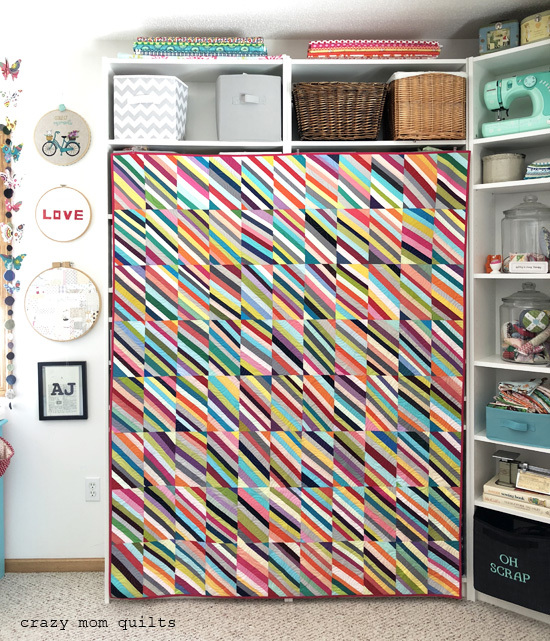 That's an awesome scrappy quilt. Thank you for the tutorial as well. My scrap bin is overflowing - this may be a fun project. Oh my, this quilt just makes me almost cry! Love everything you've done here! MMMMMMMmmmmmm You continue to amaze me every time! Love ya. 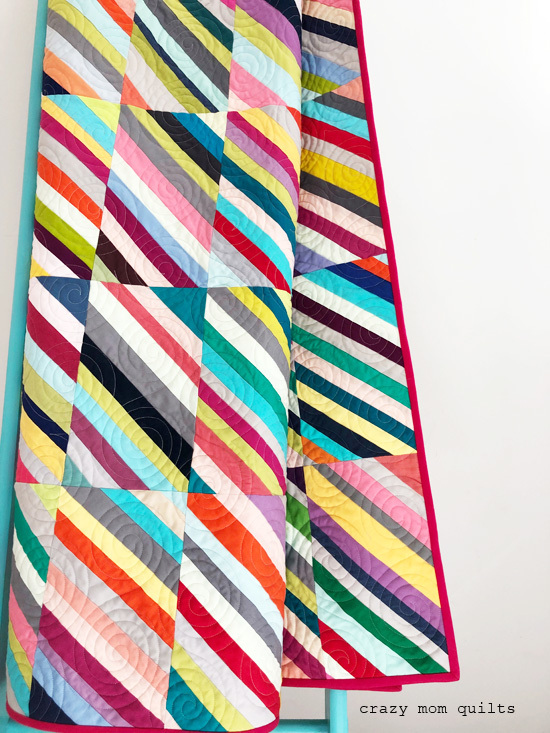 Gorgeous quilt, and it looks great hanging on your shelving. I really like how the slight difference in angles and strip widths gives your eye a lot to explore. What a beauty of a quilt - the quilting is perfect! WOW! I think that sums up quite a few of your scrappy quilts, but this is a new favorite. Nicely done, and thank you for sharing. LOVE the quilt and it's funny..I just started a rectangle string myself. It's just not going to be all solid like yours. AND I had a phone book left on the porch yesterday and ripped it apart to use for future strings! Your string quilt is wonderful! I love solid colors only in quilts but I can never stick to that restriction in my own work!! I love it but it also makes me feel a bit dizzy! 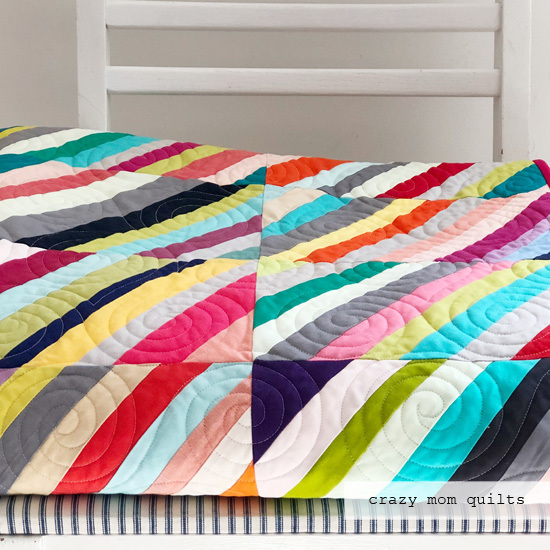 Love this fun, bright quilt! Such a clever idea, using all the blocks on a bias! Well, you are an energizer bunny, finishing two quilts so quickly. What color thread is it quilted with? I love the big spirals for the quilting. It's beautiful! I love scrappy quilts. Love Love!! Every since you made this one I've been waning to make something similar. Someday I hope. Just curious if you've washed it yet and if there were any bleed problems with all the different solids? I don't usually prewash and have heard stories of some solids bleeding. Love this! 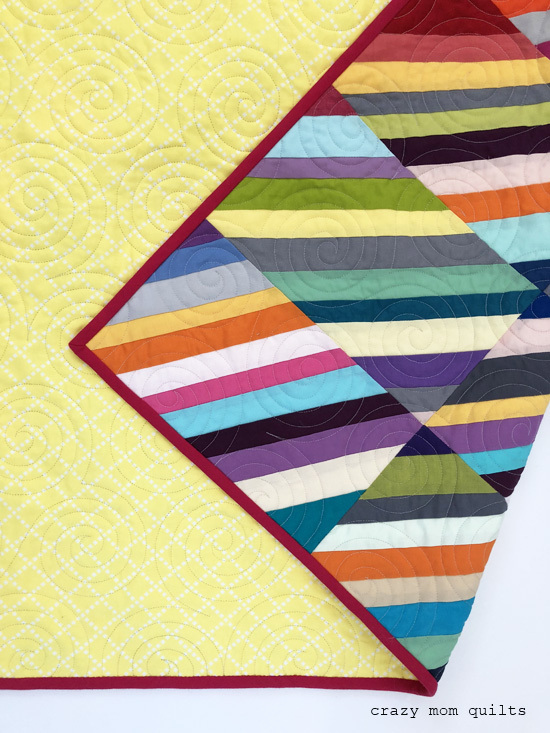 It's gorgeous and the quilted swirls are just right with the lines of the block. Looks so good together! Stunning quilt!! I would love to make a quilt similar to yours and I have made a pineapple quilt but used muslin as the foundation to save removing all the papers. 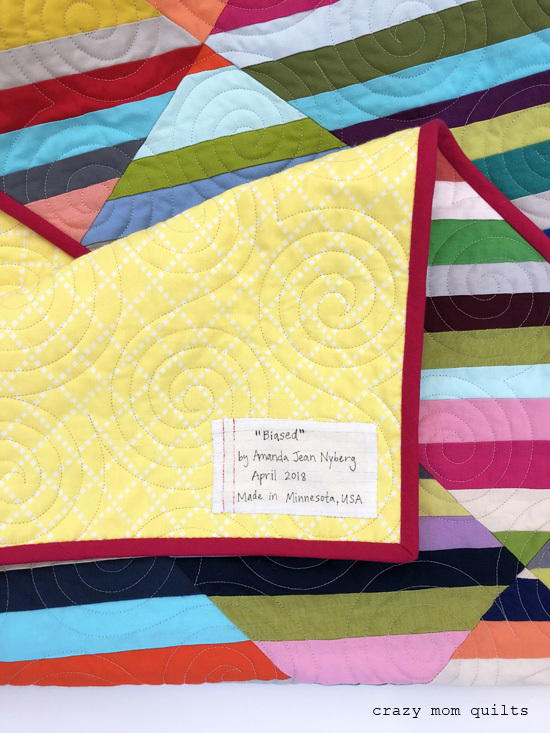 I’m always 'biased' when it comes to your quilts!